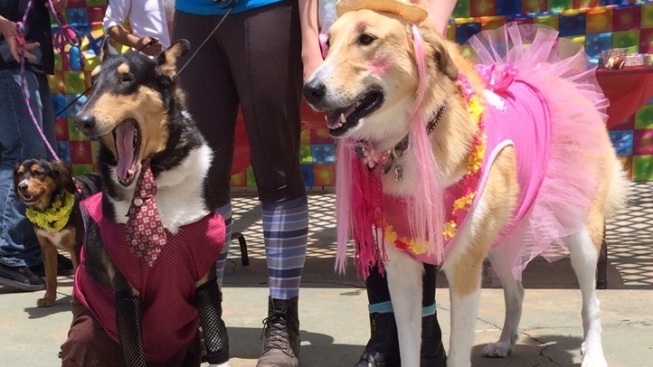 A rescue center throws a sweet party for adopters and adoptees. A rescue center throws a sweet party for adopters and adoptees on Saturday, May 7. A DANCE FOR DOGGIES: If you attended prom, you probably went through one or two or twelve outfit changes. The emerald cummerbund wasn't emerald enough; the bowtie was too big; the skirt of the cute gown didn't possess any proper twirl (a serious charge to levy, indeed). Prom, in short, is an intense time, one aswirl with feeling, drama, and high hopes. But the high hopes of many prom attendees in Rancho Santa Fe have already been met, and they didn't involve a perfectly sized bowtie or a twirlable skirt. The hopes were all about a forever home, which many pooches from the Helen Woodward Animal Center found after a tenure at the pet-sweet spot. To celebrate its alumni, and to honor a springtime tradition usually found at high school gyms and hotels, the center is hosting its annual Puppy Prom on Saturday, May 7. IF YOU ADOPTED YOUR PUP... from the center, you're invited to "visit the old school" with your pumpkin in tow. Have something prom-y for your Boston Terrier or Greyhound to wear? That's the name of the glam'd-up game. A King and Queen will be crowned during the midday event, and kids can learn to make corsages at an activity area. And will there be "wallflower adoptables" hoping to be noticed? Puppy Prom is a sweet-of-heart adoption event, too, so keep your eyes peeled for those pooches not on the proverbial dance floor. But will your Bichon Frise rock a bowtie? Or will your Cairn Terrier don a cummerbund? It's all in fun, and alumni affection, with the hope to place a few more lovable pups.